February 2018 - Guillaume Siegler spent many years working in gastronomic restaurants before moving to Japan, where he entered into a partnership to open a restaurant. 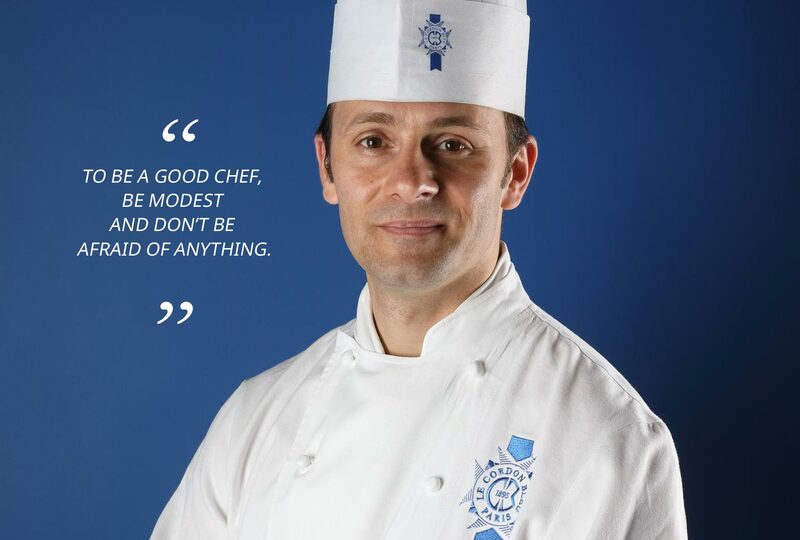 He went on to swap his entrepreneurial role for that of Chef Instructor and taught at Le Cordon Bleu Japan institute for 4 years before becoming a cuisine Chef Instructor at the Paris institute in 2017. How did you become a cuisine Chef? Where did your passion come from? I am the son of a charcutier, eating well, and meal times were the epicentre of family life. I was neither fascinated nor impressed by good food as they were part of my everyday life. I did fairly well at school but by the time I reached general high school, I was struggling to define myself. My dad had a huge amount of books and one day I took a cookbook and tried a recipe. I was 15 years old, my dad was impressed and suggested I visit a restaurant, the one Michelin-starred Pavillon Paul Le Quéré in Angers. The atmosphere in the kitchen, the leading chefs, it was intoxicating; I felt at home almost immediately. I was in Year 11 and decided to change direction and enter the world of cuisine. I took my CAP / BEP at the CFP in Angers. I began my apprenticeship at the Pavillon Paul Le Quéré, continuing at Les Jardins de la Forge restaurant, also 1 Michelin-starred. I continued my studies with a Brevet Professionnel (BP) at the CIFAM in Nantes. In the meantime, I bought my first book by Joël Robuchon and was impressed. At the age of 17, I decided to have lunch at the 2 Michelin-starred Jamin in Paris. Can you picture it? This young man, who takes the bold step of going to the capital to have lunch alone in a gastronomic restaurant?! Chef Benoît Guichard accepted to take me on for a 10 day discovery internship. It was an amazing experience and I said to myself: “I have found what I want to do; I mustn’t waste any more time”. 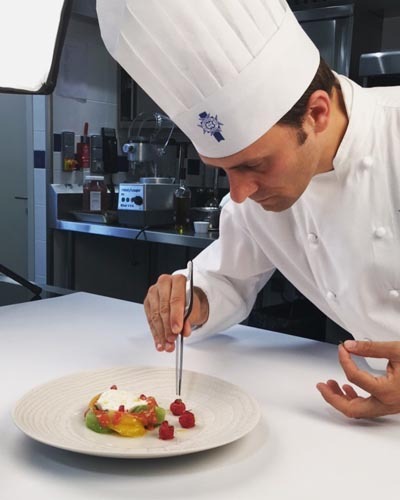 At the age of 19, I started working as a commis at the Violon d'Ingres, in Paris, with chef Christian Constant. I remained there for a year before moving on to the Carré des Feuillants restaurant where I worked for one and a half years in the role of relief commis. I had a great experience with chef Dutournier, in a poetic and romantic world in which all things beautiful were nurtured. My first job as a chef was in a bistro, Le Petit Rétro in Paris’s 16th district. I finally found myself working with traditional cuisine as opposed to the gastronomic style I was used to. This taught me a great deal. In 2003, I began working as a cuisine chef at chef Delacourcelle’s Pré Verre restaurant, where I remained for 8 years. I worked just as much on ingredient selection, designing the menu and managing the running of the kitchen, as cooking itself. I worked at this Parisian bistro for 4 years before entering into a partnership to open a restaurant in Tokyo, Japan. For 4 years, I split my time between Paris and Tokyo. After visiting Le Cordon Bleu Japan, I decided to move into teaching. I spent 9 months as a cuisine Chef Instructor, 6 months as cuisine Technical Director and 3 years as Executive Chef. We had major challenges to meet; it was the only international cuisine school in Japan at that time. They were fantastic years and Le Cordon Bleu Japan is now a widely recognized international entity! For personal reasons I asked to return to France and, in 2017, was offered the position of cuisine Chef Instructor at Le Cordon Bleu Paris institute. I love effective communication and wanted to continue to learn whilst teaching others. Educating in the field of taste is important and I am learning the way in which to share the values of a cuisine chef. Teaching and knowledge transfer were concepts I had also seen when watching my father teach his apprentices. Messages aren’t always transmitted effectively. Techniques, appearance, and results are focused on before talking about the important job done by both the land and man. Youngsters often arrive here with their heads full of dreams and our job is to increase awareness of the importance of their impact. Today, I love my job as much as ever, even more so than when I started out. There are many diverse ways of learning, no two are alike. Could you describe a typical day in the life of a cuisine Chef? I work on my lessons and teaching material (reading, research). It is a daily challenge, every lesson you need to ask yourself what could be improved for the next lesson. I give demonstrations, practical classes and work with the other Chefs on a daily basis. Demonstrations provide me with the opportunity to express myself, I live and breathe cuisine and do my best to make it come alive. As for practical classes, they enable me to understand each individual and their needs. It is fertile ground for experimentation. Lastly, I am also the referent Chef in charge of Bachelors (Culinary Arts, and International Hospitality Management) and the Diploma in Culinary Management. A good chef needs to be modest and fully aware that they don’t know everything, that every day is a clean page. It is also necessary to possess all the qualities which are essential in this profession: passion, fearlessness, respect for ingredients, etc. I would also say that it is important to maintain and arouse your curiosity, be open in the widest sense of the term: open minded, openly communicative. Finally, be modest, don’t be afraid of anything and make sure you are aware of what is happening elsewhere. Going abroad would certainly be a positive addition to your career. An anecdote about your career? The earthquake that struck Fukushima in Japan on 11 March 2011. I was both a spectator and victim of this natural phenomenon. I had to remain focused and ensure the safety of my teams and my customers. That is why I talk about starting a clean page the next day. Every day is a clean page and that is how I see cuisine.